The TOA RC-001T remote control module provides two connection paths for the new ZM-9000 Zone Management controllers. Each path or link can host up to 8 controllers depending on cable length. Do not connect Link A to Link B at any time. Remove the AD-246 power adaptor when wiring the ZM controllers as this power appears on the power lines even when the 9000M2 is turned off. 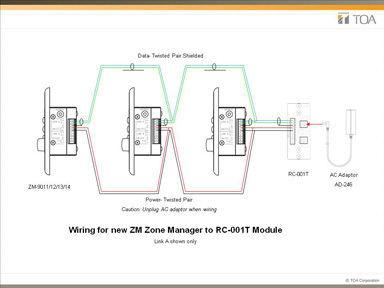 After programming the ZM modules using the TOA software, you must do an ALL DATA upload as the parameters associated with the ZM modules are not scene based and uploading a single scene will not send the controller parameters. Failure to do so may show a 9000M2 front panel FAULT indication.